Soloist and Concert Choir President Emeritus Kieran Anderson ’18 and Tour Choir members perform ”Cornerstone” in their annual Spring concert at Church of the Redeemer. 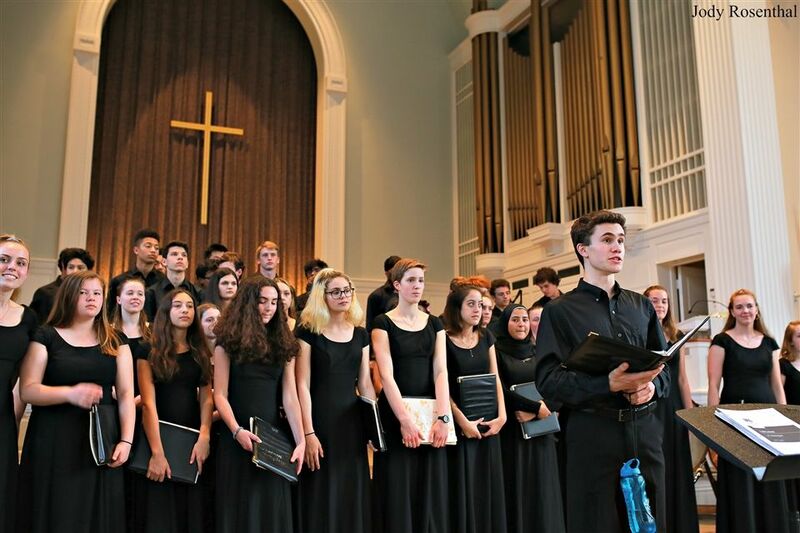 This summer, Hopkins Concert Choir departs for a European tour of Spain and Portugal, visiting Lisbon, Madrid, Lagos, Seville, Toledo, and Granada. The repertoire for the trip includes pieces from the choir’s winter and spring concerts: “Indodana” by Michael Barrett and Ralf Schmitt, “Stars” by Sara Teasdale, “Woke Up This Morning” by Jeffrey Douma, “Gambaya” by Paul John Rudoi, “Waiting on the World to Change” by John Mayer, “La Seis Cuerdas” by Matthew Harris, This Land and Passage by Javier Busto, “O Magnum Mysterium” by Morten Lauridsen, “Cornerstone” by Shawn Kirchner, and “Run to You” arranged by Kirby Shaw. There will be a concert on the day before departure where the choir, consisting of students in concert choir year round and students who learned the music outside of the class to perform on tour, will perform many of the pieces that will be showcased on tour. Schroth said that the concert will take place on Sunday, June 10, at 4:30 in the Yale Glee Club Room in Henrie Hall. Students not only will get the chance to perform internationally, but also will explore a new culture. Gillespie said “I’m most looking forward to singing in gorgeous cathedrals and churches and getting to collaborate with choirs from different countries! As far as culture, I’m really excited for Spanish food and getting to see the streets and people there!” Colin Flaumenhaft ’18 said, “I think I am most excited to explore such a new environment while still getting to do something I love: singing.” Viajes Seguros to the Concert Choir this summer!